Above: The step by step process of the painting. Below: The Man Himself, Emil. ​Director of Sole Seekers visiting the painting. 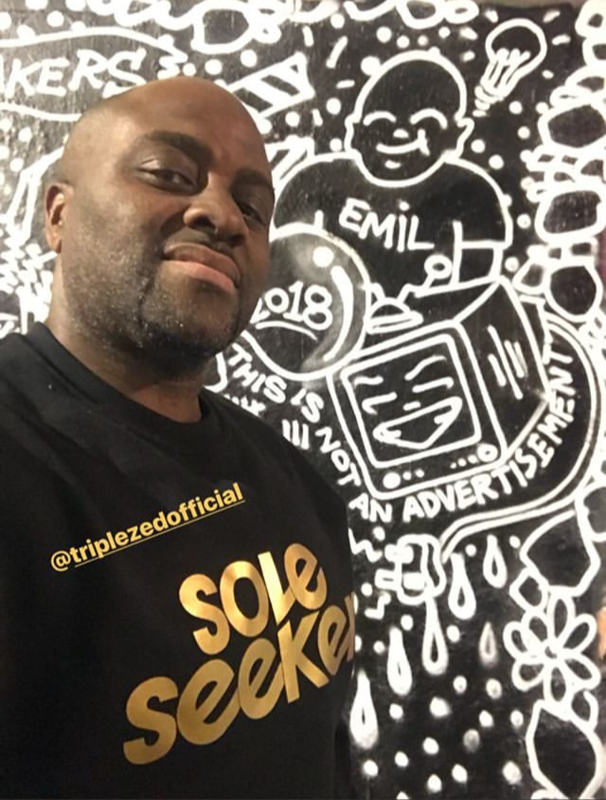 Due to my son being born earlier this year I was unable to attend the European Premiere of "Sole Seekers" this August, however I was able to catch the screening at the Charlotte St Hotel Cinema on November 11th. I congratulate Emil (the director) & all those that played a part in getting this project finished & out there, It is such a well researched & put together documentary & am eternally grateful for being involved in the film. Triplezed has a small part in the documentary, but seeing my art on the silver screen made a big impression! After seeing my art in the film I was inspired to see the film in my art. I painted the Mural this month at London's South bank (which is a heavily painted spot, so you gotta be quick if you want to see it). I included some of the cast of the film in the mural & along the bottom of the piece some of the people who have supported my work. For the latest info on the Sole Seekers Film including screenings, click here. Original design of the Sole Seekers logo by "Ch33ki Media"
To see a previous Mural from Leo Stiles click here. 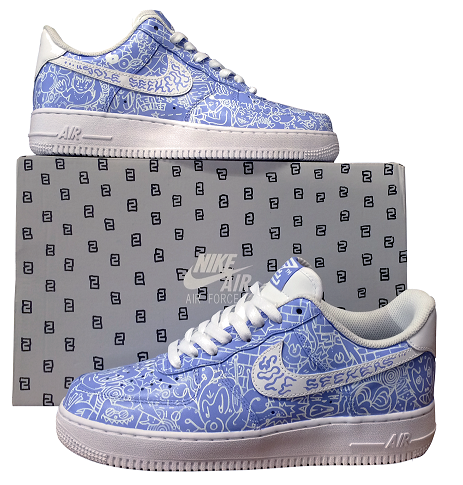 The first full length Cinema documentary on UK sneaker/trainer culture is here! A massive congrats to Emil on all his hard work & a thank you for having "Triplezed" as a contributor to the film. The European Premiere will be held at "The Ritzy", Brixton on Tuesday "28th August. See you there! On Tuesday 12th "Triplezed" had the honour of attending BFI Stephen Street, London, for a special screening event held by "Footbal Beyond Boarders". FBB is an educational charity which uses the power of football to support disadvantaged young people in the UK. 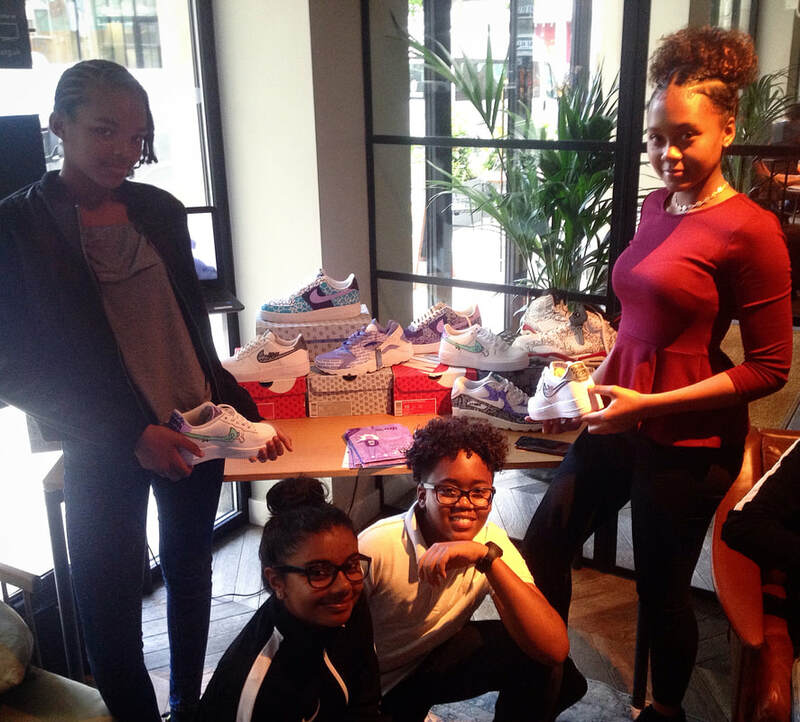 The charity teamed up with talented film maker Otis Dominique to produce a series of short films & "Triplezed" was in the building showcasing the footwear & talking with the youngsters about the process & all things zZZ. New for 2017 - Triplezed "Pin Portraits"
​Triplezed proudly presents the first in the series of "Pin Portraits". The "Half Man Half Duck" pin badge is limited to 100 pieces. Click here to grab one. - Price is for 1 "Pin Portrait"
- Free Shipping Worldwide until 2018. Triplezed is proud to present the newest addition to the Loonaticks range. 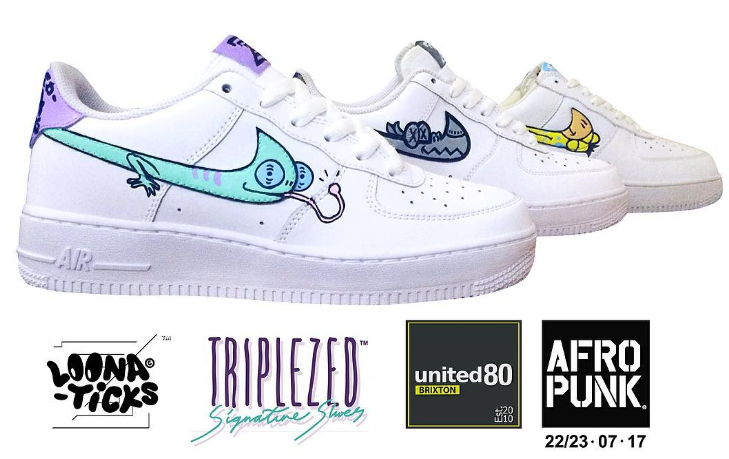 "Chameleons" along with other designs will be displayed at this weekend's Afropunk festival (London) on the United 80 table. Be sure to stop by if your'e attending. Triplezed's Leo Stiles has just spent the weekend undergoing a mural project, commissioned by the good people of Ramsgate's "Wavey Fashion" vintage store. This job saw Leo transform the exterior with his signature cartoon designs, whilst carrying the theme along the interior walls, changing room as well as the floor, at the owner Ben's request. If you want to visit the mural in person click here for its location. Above: Shoe No.121 in store. Thank you Angelo from Clapton! All the best with your new chapter in the States.